Based on some conversations with @Bill_ZRT, we've developed a theory on why the Governor's trait doesn't seem to work consistently for items. It seems as though his trait works and can upgrade the base level of an item (at least some of the time) in RSL22 and below missions. However, we have yet to see his trait work at RSL23 or above. That's obviously a big issue because that's where end-gamers are looking for max level epic and legendary gear. Forums, we need your help on this. As you start to get to RSL23+ challenge missions, can you keep an eye out to see if Governor's trait is triggered for item drops at RSL23+? If no one sees "Rewards improved" items at RSL23+, then it's very likely that this explains why his leader trait doesn't always seem to work for items. My Governor is epic L23 (leader trait still L3, 15%), and I've been using him a LOT this challenge (i.e., every single map). I can't say with 100% certainty, but I would give it about 95% certainty, that I have not once seen "reward improved" since around the RSL23 mark (presently halfway through RSL 26.2). I leave that 5% possibility that it may have happened, because I don't even look at items that aren't epic/legendary, so it's possible something may have slipped by, but I really don't think so. I can say with 100% certainty that no epic/legendary items received the "reward improved" since around RSL23. However, I cannot tell you when the last time was that I saw any item get the "reward improved" moniker, so this isn't exactly the most reliable data - more anecdotal. I for one will definitely keep a closer eye on this moving forward because the Governor has such great potential, but the never-ending duds in crates usually make him a benchwarmer for me, with Maggie in his place. Good luck @JayZ and @Bill_ZRT , I hope you guys can figure this thing out!! FYI @TheCrab, the Governor doesn't improve the base rarity of an item (i.e., he doesn't make it more likely to get Epic or Leg gear). His trait only affects the level of the item (e.g., 22, 23). Thanks for keeping an eye out @DBones. If we get an overwhelming response that people DON'T notice anything, then it might support our theory about why Gov's trait isn't working. Also, it would be helpful if @Shteevie or @Fearofabotplanet could weigh in on this. Hopefully this targeted theory is more helpful than simply complaining about Gov's trait not working. I've seen the upgrade of every level, except the last level. Never 22 to 23. Don't know if it is due to RSL, capped chances or something else. My Governor is Legendary L22 and I've been using him on every map (started with 5 RPs). 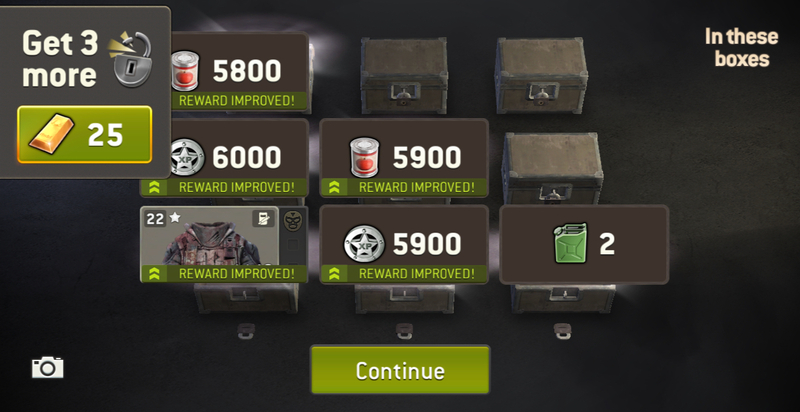 I'm through RSL 26.1 and can tell you with 100% certainty I have not seen any "REWARD IMPROVED!" on any gear at any RSL period. I also understand there are many “other” things you can get from rsl 24 scavenger missions such as components, fragments, gold, gas, supplies, xp etc. So the crate would have to not be a gear reward and lvl 22 (before rewards improved) to meet the criteria to be eligible for improved. When you factor in all of this, without doing any data analysis, the odds of meeting the criteria are low to begin with then factor in the odds of it meeting the criteria it seems like way way way less than 15% of the time it happens. All it takes is 1 person to disprove this theory. We are asking the community to help aid in this theory. I'll definitely keep an eye out for this, it's an interesting theory. My baby "account" (which I have to not lose perspective while my main account is maxed out) has the Guv and I'll see the reward improved as much % as should be expected while on my main account I've seen 2 pieces of gear upgraded having run hundreds and hundreds of missions with him. Though I always grind the lower challenge levels with him (up to 26) and, like I said, I've seen 2 pieces of gear "improved", so this wouldn't explain everything. It is not that hard to see though. I have had numerous rewards improved. 100+. Never 22-23. Always in beginning of challenge, season missions. And what are the limits? 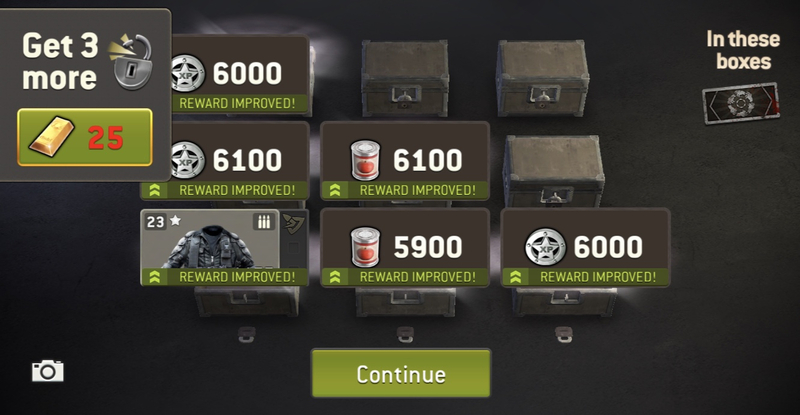 So I do am curious about if it is possible to have a reward improved to max level. But there is no doubt that chances decrease when you get close to max level. 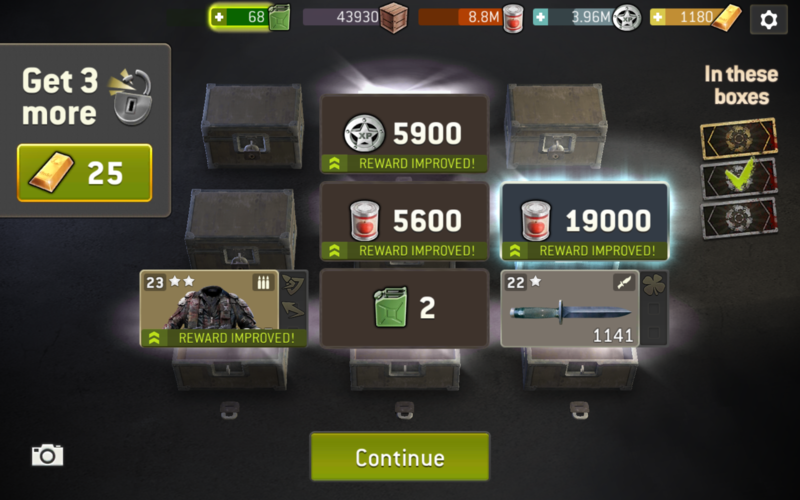 I have a level 22 legendary equipment showed "reward improved" earlier, not sure about the exact RSL but it's lower than 23 if I remember it correctly. To be fair, we HAVE seen a level 22 item improved to 23 from @zbot. However, that was on a RSL22 mission, so we still have not seen any evidence on RSL23+. If it’s possible to switch off getting supplies at a certain camp level it’s not insane to think the same is capable for this trait. If it’s possible not to get supplies after a certain rsl in challenges it’s not insane to think the same is capable for this trait. I’m not expecting every piece of lvl 22 gear to become lvl 23. But I’m asking for someone somewhere to show me one they achieved on a rsl 23+ map. For months I've used the Governor in every challenge from the beginning until around RSL 25 or so. 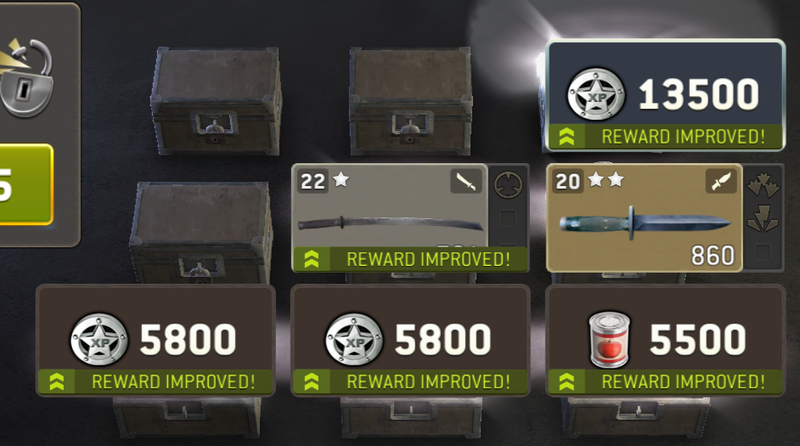 I don't believe I've seen "reward improved" on any piece of gear at any level ever. Hundreds of gears at the lower RSLs and not even once. My scavenger missions start at RSL 24 and I have run hundreds, maybe even a thousand with my Governor and never once saw "reward improved" on a piece of equipment. I didn't even know that was a possibility until I saw it posted on this forum. There were 40 opportunities for his ability to work on gear, out of those 40 times, it worked twice for a success rate of 5%. In order for his ability to work 15% of the time, I would expect to see it happen 6 times out of 40 opportunities. My governor started the challenge at Epic (15% chance) and ended at Legendary (18% chance) because I got some nice Governor radio calls. I can't say for sure what RSLs I was at, but thanks to the time/date stamp on my screenshots I know that both hits happened on the 16th and 17th, at the beginning of the challenge, and I got no hits on the 18th-19th (when I had 19 opportunities for his ability to activate on gear) when I was playing at higher RSLs. A had a rare item improved to level 22 and a common item improved to level 23. It's a small sample size for sure, but I would love additional players to do the same thing... play the Governor in the lead spot in whatever game mode you play and take a screenshot any time you get a non-max level piece of gear (since that represents an opportunity for his ability to work). And of course take a screen shot any time his abiltiy actually does work whether is max or non max level. Do the math and post your results. Are you getting anywhere near 15%? Are there RSLs (or other variable) at which players aren't seeing the ability to work at all? Thanks!! When playing RSL 17. The range of possible weapon lvl is mostly 15, 16, 17, 18 and 19. All of them can be increased by governor. Together they have governors trait chanche. When playing RSL 27 theoraticaly it would be 25,26,27,28 and 29. Since max is 23, all of them become a set chance at 22 or 23. Governor can't help anymore. When playing RSL 23, it would be 21,22,23,24 and 25. Only 21 and 22 can be helped by governer, but 23,24 and 25 can still be lvl 22 and governor can do nothing about it. You lost me here... I agree that the gear will be either level 22 or level 23. If it's level 23, the Governor can't help, but if it's level 22 his ability can still raise it to level 23. You lost me even more here, especially the part that I bolded. What do you mean when you say: 23,24 and 25 can still be lvl 22 and governor can do nothing about it? If the gear is level 22, the Governor's ability can still activate and make it level 23. So the theory I'm posing is this. Or you could say: any gear that should've been lvl 23 or higher, already is at the max chance to become 23. So governor can't improve them anymore. but if it's level 22 his ability can still raise it to level 23. So my point is this. What if that won't work on a lvl 22 out of what theoraticaly was a lvl 27? This was from trial 1 from Season 8 Mission. Don’t know what rsl it is. @JackBauer My guess it was RSL21 because that has the opportunity to drop level 20, 21, and 22 gear. Also, if you're an end-gamer, trial missions start at RSL-2. 2nd trial of this weeks season 8 mission. In terms of RSL 23+, when I was writing in support about the Guv not working I took 100 screenshots of missions at RSL 25, though I've run hundred and hundreds more without an improved reward. Still got them, though they'll likely go the same way most of my other screenshots go some months in the future. Here's my tiny data sample from this last challenge. Found 26 pieces of base level 22 gear. Got improved to level 23 a grand total of ZERO times.